The sounds of backhoes, hammers and other construction equipment will ring through campus this summer as work moves forward on many of the projects outlined in President Jim Tressel’s “NextYSU: A New Look for a New Era” campus development plan. Tressel outlined the plan before a crowd of more than 300 faculty, staff, administrators and community members in Kilcawley Center late last month. “Everything that we are talking about are things that we’re dreaming about – some of them are beginning now, some of them six months from now, some a year from now – and some of them we’ve got a lot of work to do for them ever to happen,” he said. University Edge student apartments under construction on Rayen Avenue. The president said YSU is at an important crossroads. “As the higher education landscape continues to evolve, as resources become more scarce, as our demographics continue to change, it is imperative that YSU has in place the campus infrastructure that will allow us to build and sustain growth for the years ahead,” he said. The plan, he said, is necessary for the university to compete. Funding will come from a variety of sources, including private developers, donors and grants, as well as local, state and federal money. To watch the president’s presentation, visit www.ysu.edu/president. West Side: 382 beds of privately funded student apartment housing and retail called University Edge. The first 162-bed phase will be open for the start of Fall semester classes and is fully leased. Smith Hall on Fifth Avenue will be demolished. Also, YSU is taking the lead for a federal grant to create a “Meds to Eds to Tech to Rec” connection along Fifth Avenue. Wick and Lincoln: The city of Youngstown begins construction late this summer on major improvements to Wick and Lincoln avenues. Also, Wick parking deck will close for improvements May 9 to Aug. 15. 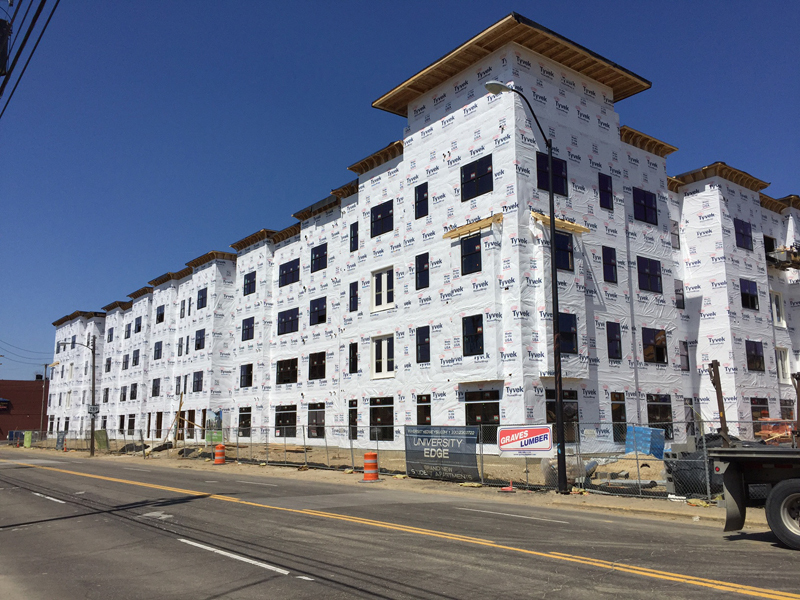 In addition, two private apartment projects are being planned along Wick Avenue – by LRC Realty of Akron and by NYO Property Group. Student Success Center proposed connector from Jones Hall to Maag Library. Student Success Center: Consolidate all student retention/success services in a new Student Success Center on the third floor of Jones Hall. 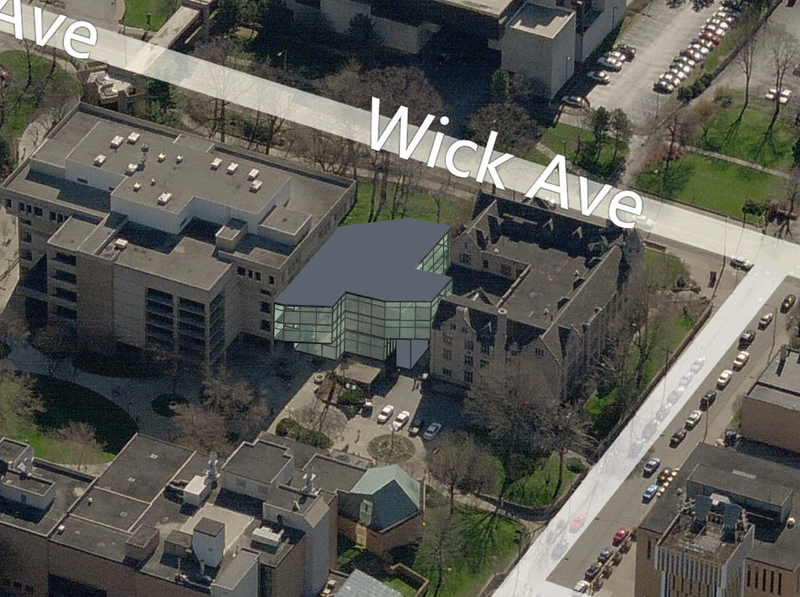 Eventually, plans call for the center to expand into Maag Library via a connector. Bookstore: Currently negotiating with Barnes & Noble to take over operations of the bookstore in Kilcawley Center. Tressel said it’s also possible that Barnes & Noble could consider a stand-alone bookstore adjacent to campus. Melnick/Fok: Melnick Hall on Wick Avenue has been fully renovated and is now the home of the YSU Foundation and WYSU-FM. The Honors College has relocated to Fok Hall, formerly Alumni House, at Wick and University Plaza. 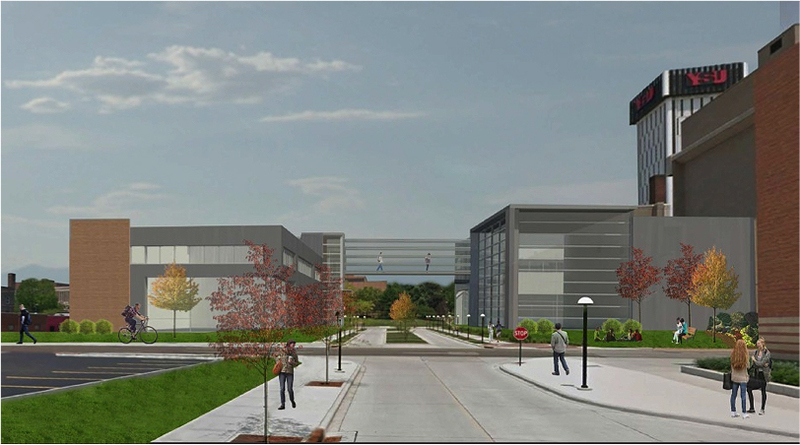 Proposed Mahoning Valley Innovation and Commercialization Center. Mahoning Valley Innovation and Commercialization Center: A collaborative effort to create an entrepreneurial hub that includes educational and research space, as well as state-of-the-art manufacturing laboratories. “We firmly believe that this new center will provide a unique environment in which innovation and entrepreneurship can thrive,” Tressel said. Heritage Wall: Just north of Kilcawley Center, the wall would honor recipients of the Heritage Award, YSU’s highest award for former employees.